THANK YOU for supporting SW Washington's Community Health Advocates and Peer Supports (SW CHAPS) Network! 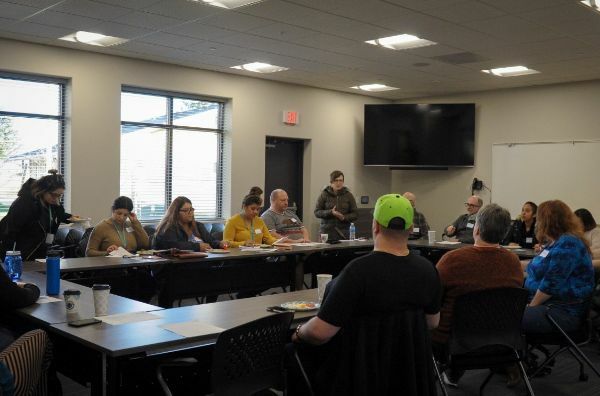 Photo of Feb 21 2019 SW CHAPS Network Meeting at Bridgeview Resource Center. February 21 we met a discussion about Supporting Housing Challenges and Advocacy. Jovian John from Bridgeview Resource Center welcomed us and shared the intent for the new Education and Resource Center in the Heights neighborhood. Jodi Freydenfelt spoke about the new upcoming Caples Terrace, VHA’s newest building expected to be completed this summer that is specifically being built for supporting foster youth transitioning into adulthood. David Overbay from Vancouver Housing Authority fielded questions about rent challenges during Government shutdown and other unexpected economic situations and helped us understand VHA’s strategic plan to cover subsidized rent during those times. We were able to introduce and highlight the awesome work done by our network member Shannon Livingood and her non-profit Pathways to Living Good which helps furnish newly housed families in Vancouver who are often coming from domestic violence situations. We learned more about how the Resident Action Project is supporting authentic community voice and perspective through direct actions in Olympia. We joined in the upcoming Direct Action by creating posters to be posted on social media and taken to Olympia for the HHAD event. Housing and Homeless Advocacy Day was in Olympia FEB 28! Where a few members of our network joined 600 other advocates in encouraging our lawmakers to support bills that increase access to affordable housing. Join us in the near future at an upcoming event!